I don’t know the name of this church, but I really like the colors. 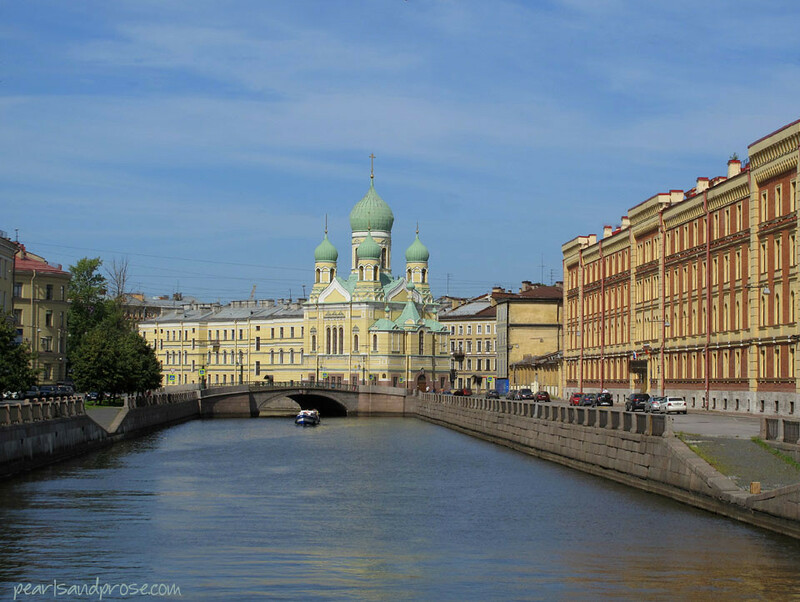 This entry was posted in photography and tagged canal, green onion domes, Russia, St. Petersburg, yellow church. Bookmark the permalink. I am struck by the juxtaposition of the blue onion domes and the blue sky — and the bluish water, reflecting the bluish sky. The buildings frame the waterway very nicely. The photograph really brings home to me the extent to which water appears to be so much a part of St. Petersburg. Yes! I vaguely knew that St. Petersburg was built around a river, but did not know there are nearly 100 tributaries and canals! As if the architecture weren’t enough, you have all these waterways too. I can see why so many people say it’s one of the most beautiful cities in the world. I would consider it a must-see, Caroline. It looks like a gorgeous cake topper. 🙂 I feel like I’m stepping into a Tolstoy novel. Absolutely lovely, and you had lovely weather while you were there. I was so glad my good-weather karma held up, Jackie. Yes, it was like being in a Tolstoy novel, or the movie Dr. Zhivago for sure. I wish we’d had time to see Moscow too.